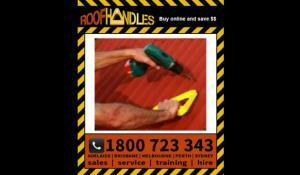 Get the Climb Safely with Roof Handles delivered. 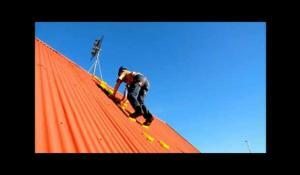 Save on Roof Safety equipment with our low prices. Roof Handles make it easier to access any part of a tin roof surface (outside). Made from robust UV stabilised plastic. Extremely tough!. Every tin roof is held down with tech screws or roofing nails, which hold down the roof sheets, so no end of choices to place the device. Place more up and along the roof pitch in front of you as you go. Frost and rain won’t stop early starts when using the grip from Roof Handles! 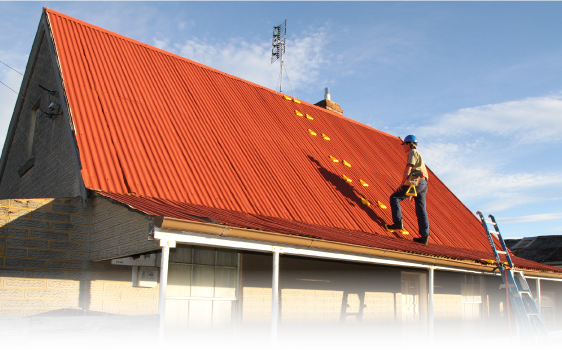 Regularly inspect each individual Roof Handle for fractures and defects. Do not use if not in original condition. If leaving Roof Handles permanently affixed it is recommended to put silicone around the screw hole in the roof and between the rubber grommet of the roofing screw prior to tightening back down. It is recommended to prevent water ingress at this seal, to periodically inspect and re-seal if neccessary. Roof Handles are not a safety device. A fall arrest harness should always be worn when working at heights connected to a rated anchor point. We recommend that all structures be thoroughly inspected for integrity prior to attaching and using Roof Handles.